You are looking at a refurbished Dell Optiplex 760 computer. This is a good spec PC for someone who still needs to use Windows XP - and as it has a Windows 7 COA we also supply the Windows 7 32bit reinstallation disk too! If you are in any doubt if this system is suitable for your needs please contact us first, we would be more than happy to help! These systems come pre-loaded with a fresh install of Genuine Windows XP Professional. 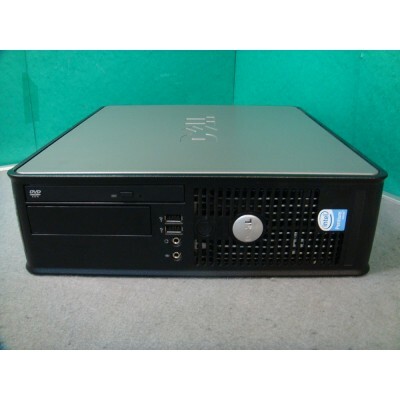 This has been installed as per Microsoft Windows XP downgrade rights (with Windows 7 COA attached) and we also supply both the Dell XP Backup Disc (with SP2 only) AND the Dell Windows 7 32bit Backup Disk. Please note that as Windows XP has no support on the internet we do not recommend this system for general internet use and cannot guarantee it will run on the internet, even though we do install Opera browser and Malwarebytes anti-malware. Ready to plug in and go!! ​PLEASE BE AWARE THAT, AT THE TIME OF LISTING THIS ITEM, THE PROGRAMS LISTED ABOVE ARE ABLE TO FUNCTION WITHIN WINDOWS XP. HOWEVER, THE SUPPORT FOR XP HAS NOW CEASED AND SIMILARLY PROGRAMS THAT WERE DESIGNED TO RUN ON ITS PLATFORM MAY ALSO STOP WORKING AT SOME STAGE. IF YOU ARE IN ANY DOUBT IF THIS SYSTEM WILL MEET YOUR REQUIREMENTS, PLEASE CONTACT US BEFORE YOU BUY AS INCOMPATIBILITY IS NOT COVERED BY THE WARRANTY. As these systems are used, there maybe minor cosmetic marks, such as small scuffs on the casing, or a missing rubber foot or backplate but nothing that affects the working of the system. As we have more than one available, the photographs here are fully representative of the one you will receive (we have picked one that has no backplate but some will have them). If you are in any doubt as to the condition of the PC please contact us BEFORE you buy as the cosmetic condition is NOT covered by the warranty. We supply this previously used system with a 60 day RTB warranty. The warranty covers the hardware only, we do not warrant software. All PCs have been fully tested before being sent out. If a problem does arise within the first 60 days, please contact us first by email or by phone, as most problems can be resolved this way. If we are unable to fix the problem over the phone then the item can be returned to us for repair at your expense and we will return it to you at ours. We will post the item using a fully tracked and insured economy service. You also have the option to upgrade that to a 24hour service for just £1.99 extra. Please note that all our carriage options apply to Monday to Friday deliveries and do not include any weekend deliveries. We will post the item within 1 working day, for example if you buy on a Friday after 1pm, Saturday or Sunday, we will post on Monday(unless it is a bank holiday and then it will be Tuesday). If paying with Paypal the item must be delivered to the address on the Paypal payment - no exceptions.